Kayne West For President In 2020 - This Is What People Are Saying... Would You Vote For Him? 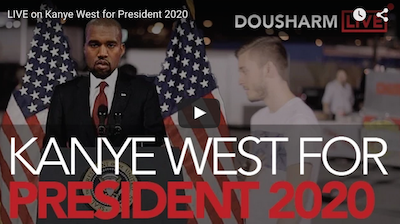 20-year-old Joseph Dousharm and his trusty sidekick/camera woman Janelle McCarthy (which combined create DousharmLIVE) decided to hit the streets of Las Vegas and ask people what they think about Kanye West running for President in 2020. Kanye West recently announced that he will be running for the president of the United States in 2020. let’s see how people on the streets feel about that!